Charles Sargeant Jagger was born in Kilnhurst, South Yorkshire on 17th December, 1885. He left school aged fourteen to learn the craft of engraving on silver with the Sheffield firm of Mappin and Webb. He also studied at the Sheffield School of Art in the evenings before in 1907 he won a scholarship to the Royal College of Art, South Kensington. On the 5th November, he was shot through the left shoulder and evacuated first to a hospital in Malta and then back to England. Once recovered he married Violet Constance Smith before he was sent out to the Western Front where he was wounded again in 1918. In recognition of his valour, he was awarded the Military Cross. 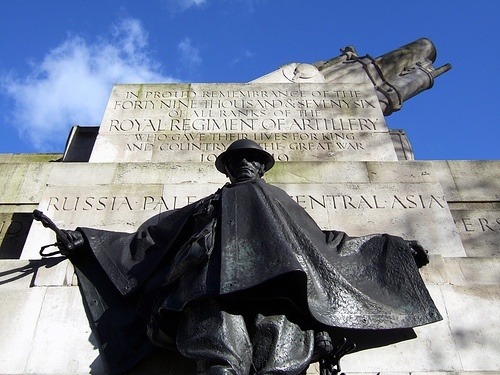 As the Armistice was declared on November 11th 1918, a convalescing Jagger heard that the British War Memorials Committee were looking for sculptors who had first hand experience of the war. Jagger immediately realised he could use his experiences to create works that would honour those who had died and later admitted that it was the horror of Gallipoli, not the trenches in France, which most influenced the work he would undertake.